Samsung Electronics Co. on Tuesday showcased its latest premium QLED TV models in South Korea that boast various artificial intelligence features. The South Korean tech giant said it will release 11 models with "intelligent displays," ranging from 55 to 82 inches throughout June, along with six more, including an 85-inch TV, by the end of this year. Samsung said it is especially focused on expanding its 2018 edition models that are sized 75 inches and above in line with market demand. The company estimates the market for TVs with screen sizes at or exceeding 75 inchs has been growing 30-40 percent annually, with the combined demand expected to reach 1.8 million in 2018. Accordingly, Samsung said it plans to widen the gap with rivals in the size segment and remain as the world's top TV maker for the 13th consecutive year. "It is more correct to call TVs 'intelligent displays' down the road," said Han Jong-hee, the head of Samsung's Visual Display Business, also highlighting that the three elements of its QLED TVs are consumers, connectivity and entertainment. 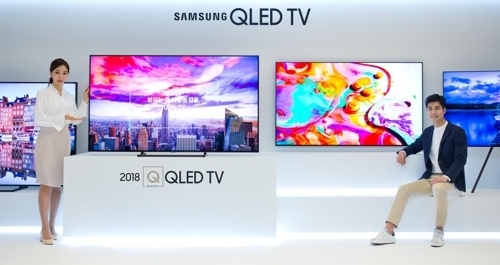 "As the hub of IoT technology, (QLED TVs) will connect all Samsung products and allow users to monitor them through a large-sized display," Han added, calling its TVs "smart centers with the biggest screens." "(Samsung) has been leading the global market by thinking in advance regarding the needs of consumers," Han said, claiming the company will open yet another era of the display industry. The new Samsung's QLED TVs feature a magic screen feature, also called "Ambient Mode," which displays various information from news to photos even when not in use. These sets come with the company's "magic" cable system that combines different connecting lines used by TVs into one. Samsung said its new Ambient mode consumes very little power, claiming that three hours of use of the magic screen for a 55-inch TV will only cost roughly US$0.7. The company added the magic cable can also extend up to 10 meters, allowing users to install their TVs anywhere. The 2018 QLED TVs also will feature the "AI 4K Q Engine," which delivers optimized resolution through its five-step algorithm. Samsung said the engine will improve low-quality videos into a near 4K resolution. Based on the quantum dot technology, Samsung said the TVs will also deliver detailed resolutions. The company promotes the quantum dot technology as its standard for premium TVs, whereas LG Electronics Inc. utilizes OLED technology, which does not need backlights, for its high-end TVs. The TVs also come with Samsung's AI voice-recognition system, Bixby, which is currently installed in high-end smartphones as well, along with the SmartThings application that connects to other devices through the Internet-of-Things (IoT) technology. Samsung said TVs will continue to develop as the main hub of IoT solutions by connecting to various home appliances down the road. The price tag of a 55-inch Q6 series stands at 2.79 million won ($2,599), and that of 75-inch model is 8.69 million won. The 65-inch Q9 series stands at 6.09 million won, and that of 75-inch edition in the series tops 10.4 million won. With respect to the latest trade dispute between Washington and Beijing, Han said Samsung Electronics does not have plans to adjust production in China for now. Han also said it is too early to comment on the establishment of a TV plant in the United States at the current stage. On the MicroLED TV first showcased in Las Vegas earlier this year, Samsung said the 146-inch product will be released in the second half of 2018.